Halloween Jack by NETENT > Scary HIGH VOLATILITY Slot ! Halloween Jack™ Netent Video Slot is here, Trick or Win ! Get ready for the spookiest gaming experience you will ever have with Halloween Jack™. Released on the 24th October 2018, this high volatility online video slot had been eagerly awaited by players and had given all those overly excited for the Halloween season yet who were too old for trick or treating something extra to look forward to. This scary NetEnt slot game is certainly not for the faint hearted! Set in a dark cemetery, the backdrop of this slot will send chills running down your spine. It depicts leafless trees standing in the misty graveyard as the night falls, crows sitting on their branches, eyeing the player. The reels are framed by two ivy-ornamented stone columns illuminated by spooky looking jack-o-lanterns. Death is even seen leaning on a couple of them on the left-hand side of the reels! Not one detail has been left out by the slot provider – not even the spin button which is full of intricate designs and seems to be sitting in the jaw of a skull. When you hit a big win, it suddenly comes to life, and beams an orange light upward as it lifts to reveal the total payout, a multitude of coins flowing out of its mouth and onto the screen. The incredible graphics paired with the harrowing soundtrack this video slot features make for a spooky gameplay filled with excitement for it displays an impressive RTP of 96.28%. Halloween Jack slot is a 5-reel, 3-row slot game with 20 fixed bet lines. It uses Jack and the Beanstalk slot engine. It is playable with a minimum bet starting from just 20p up to the maximum bet of £100 per spin. The visuals of this online slot are breathtaking… in horror! All the symbols featured upon the reels are directly inspired by the haunting Halloween theme of this slot game, from the lower paying symbols representing revamped versions of the classic 10, J, Q, K and A royals covered in zombie hands which seem to be springing out of the ground, pulling them down into the soil. When it comes to the higher paying symbols however, they are even more sophisticatedly detailed and very scary indeed. They depict a horseshoe, a raven, a bat, a horse, and a young woman whose looks will make gamblers jump from their seat. According to the paytable, if one is to land 5 of the red eyed raven or the bat on an active payline, they shall receive 250 coins, whilst the bloodcurdling horse symbol will pay 750 coins for every 5 symbols featured in a winning combination. As regards the highest potential winning combination, it may be achieved by landing 5 of the symbol representing the seemingly possessed young woman staring eerily at players on a bet line, for such a winning combo will grant the staggering sum of 1000 coins! This online video slot machine also features a wild symbol which represents the carved pumpkin everyone has in mind each time Halloween is mentioned. It may appear on reels 2, 3, 4 and 5 in the base game and has quite a few tricks up its sleeve, however its main purpose is that it may act as a substitute for any other symbol aside form the bonus game’s special lantern symbol and the Scatter symbol. The latter represents a golden treasure chest with sophisticated patterns. 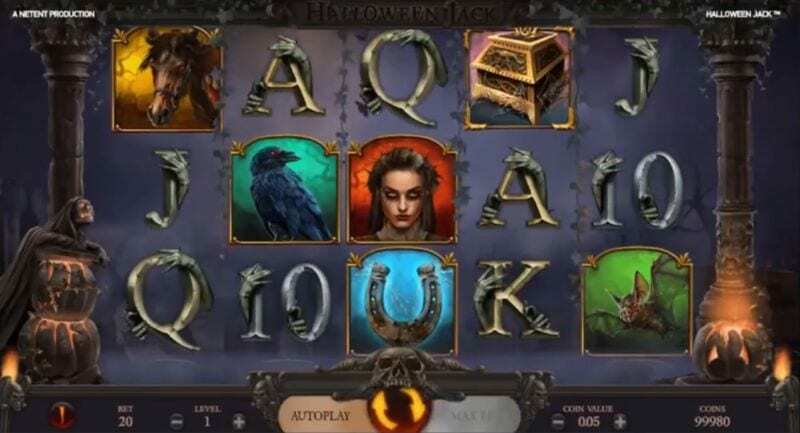 Perhaps the most spine-chilling yet exciting aspect of Halloween Jack ™ is the Special Features this slot machine comes with which make for a memorable gaming experience. The Carved Pumpkin Wild for example is full of surprises – not only does it award a Re-Spin everytime it makes an appearance on the reels, but it will also multiply winnings obtained from a winning combo it completed by x3! On top of that, every time a Wild symbol land on the reels it will trigger the Walking Wild feature which can be activated both in the main game and during the Free Spins. During the Free Spins however, the carved pumpkin Wild may only appear on reels 2, 3 and 4. This special feature will reward you with a Re-Spin during which all the Wilds on the reel will move one reel to the left, and Re-Spins will keep coming until there are no more Wilds on the reels. The Scatter symbol found in this online slot machine also has a lot in store for gamblers, for landing 3 or more of them will unlock the Free Spins feature. If this occurs in the main game, you will receive 10, however if 3 more happen to appear on the reels during this feature, you will be awarded an extra 5 Free Spins. All the Free Spins are played at the same coin value and bet level than during the spin which activated the feature. If you happen to unlock both the Walking Wild and the Free Spins at the same time, the latter will be played first. If that wasn’t enough, the Free Spins also hide an array of exciting Special Features which offer you a chance at making so big wins. Stacked Hell Hound Wild – If you manage to collect 3 lantern symbols, the next Wild which appears on the reels will become a 2-high Stacked Hell Hound Wild. This terrifying hound straight out of the eternal Hell-fire will then trigger the Walking Wild feature. Stacked Jack-o’-lantern Wild – Collecting 6 lantern symbols will transform the next Wild to appear into 3-high Stacked Jack-o’-lantern Wild which will in turn activate the Walking Wild feature. Expanding Death Reaper Wild – Collect 9 lanterns and you will see the next Wild to materialise on the reels turning into an Expanding Death Reaper wild symbol, representing death itself! As soon as this happens, the Walking Wild feature will be activated. Watch in awe- or in horror – as the Death Reaper lurks on the reels, shifting by one reel with each Free Spin. 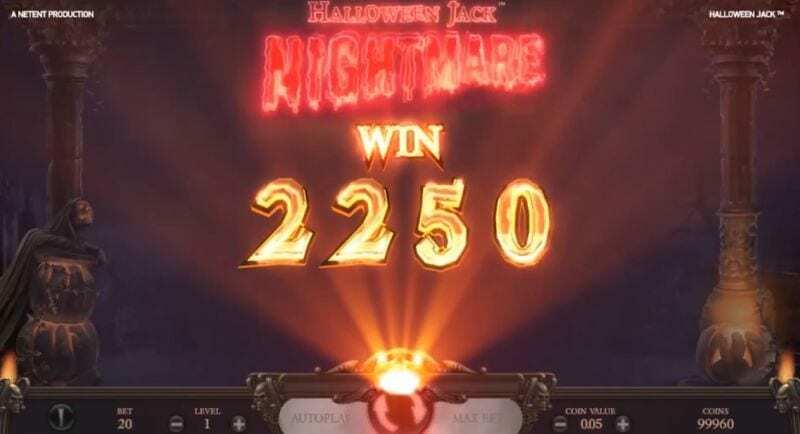 Halloween Jack ™ has to be the creepiest slot ever developed by NetEnt! It is sure to please all players with a taste for horror and who are found of the spookiest holiday of the year – Halloween. Playable from 20p a spin, this online slot game is packed with fun and spooky Special Features and some terrifyingly realistic animations which make for an immersive and chilling gameplay. On top of that, it has an interesting payout percentage of 96.28% and a Hit Frequency of 34.43%. One may spin the reels of this video slot from any mobile device, whether it is on pc, tablet or smartphone. With a max win of £300,000, this high volatility slot game is well worth a spin, however be warned – it will haunt you in your sleep!